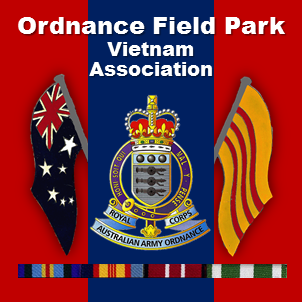 2013 – Darwin NT – Ordnance Field Park Vietnam Assn. Our Darwin reunion was a great start to our second round of reunions in every state in Australia. As us ual, members started arriving a few days early to prepare for the unknown. On Tuesday evening the 23rd the Acting Officer Commanding of 1 Supply Company, 1 CSSB Darwin, Capt Carolyn Wood welcomed us to Darwin and invited us to a tour of the Supply Company the next day at Robertson Barracks, to be followed by a BBQ. Wednesday the 24th we were taken to Robertson Barracks by bus where we met by the CSM and A/OC Capt Woods and the tour began. A presentation of memorabilia for the unit HQ walls, in the now famous Bob Nash Corridor, was made by Tony Flanagan (FSB Coral commemoration items provided by Les Wilkinson) and Bob Nash (a framed replica of our new unit banner) at the BBQ, after we had all been treated to a fine display of the modern army equipment. The soldiers not only knew their stuff but were very well spoken and polite. At 2.30pm (1430hrs Army time) we were driven back to our hotel and most headed for a watering hole. Faces to reappear from the past were Steven Benfield and Trevor Rackley, last seen in Wodonga. Our usual non drinkers and excellent attendees Laurie and Ann Manna were there. Our blind mate Geoff Conway minus guide dog, but with his loving wife Cheryl, was also in attendance. Our little mate Greg Quinlan, all the way from the US of A, made his third attendance since being found by Bob Nash in 2008. He thoroughly enjoyed himself, but who wouldn’t with mad mates like Ian and Libby Tasker and Harry and Kath Couper and Mick Sporn and Annette Saberton firing of jokes every thirty seconds. George and Rhonda Foster checked out the city and surrounds by foot – they love a good walk. Age shall not weary them and Lawrie and Val O’Neill keep proving that. Lawrie, as well as Val, are 79 this year. They must be on something!! . Amy Chambers, widow of Jack and well into her eighties, was able to make it again, along with Suzy Baines. Our new attendee, and we have always had one at each of the nine reunions, was the lovely Dawn Nicholson from WA with her hubby Bob- he’s not a first timer. We were also joined by a small group from AOD who are organizing next years ORDNANCE IN VIETNAM next March in Sydney. ANZAC Day a number of the group went to the Dawn Service which was huge. Bob and Tony laid a wreath on behalf of the unit. Then back to the hotel for breakfast. At 8.45am we all proceeded to the form up place and didn’t we look smart. A very smart OFP in coats ties reunion caps and medals gleaming in the sun. We were lead by our only officer (a Nasho gone bad ) Lt Col retired Alan Davis. It’s a pity there weren’t more like him. We were pleased to have current serving member WO2 Mick O’Neill (ex Supply Company) joined us for the march. With our new Banner flying, flanked by both the Corps and National flags, we were the ants pants. The only ones to equal our dress standards were the serving members of the armed forces, Navy, Air Force and the Army. We stood out and didn’t the ABC love us. A proud group of Vietnam Veterans marching in step all the way down the parade route looking a class act regardless of the heat. The coats caps and ties stood us out above the non military marchers. Even our girls got in the act. Those with relative’s medals marched at the back of the group. After the march some went back to the hotel others to the RSL waiting for our lunch package. 12.30pm it all started and the staff were very much on the ball with the drinks and the dinner was excellent. At 4.30pm we rolled out to various venues to either have a nap or continue drinking. Friday 26th we caught our bus tour of the Darwin War Museum and cruise around the harbour. That night a group attended the Normie Rowe concert at the RSL. A fantastic show put on by Normie and we had pics taken after the show with him. The concert was well attended by the RAE Tunnel Rat Association the OFP and some Navy and other ex military personnel. A couple of our own looked after Normie when he was in Vietnam and a had a good talk about the past with him- Michael Grosse was one, guess who the other was? Saturday the 27th saw us head off to watch the jumping crocodiles and there were plenty of them you wouldn’t last long in those waters with the mob we saw. On the way back to the hotel we stopped off at the Humpty Doo Hotel for lunch, which was a late call to them by the bus company. 112 people walk in off the street for a meal at the same time. I can imagine the chef’s reaction. All went rather well even though the service wasn’t the fastest and some missed out on a meal. At 6.00pm Ros Golding and Annette Carey were pinning flowers on the ladies dresses and everyone was sorting out where they would sit. We had current serving member SGT Shannon Shores join us for our dinner dance. The menus were absolutely beautiful. Bob Nash does an excellent job since taking over from Kathy. At this stage our excellent Banquets Manager, Mike Shaw, had his team in full swing. The surprise package of the night was THE AUSTRALIAN ARMY BAND DARWIN lead by Capt Darren Cole and Warrant Officer Class Two Rod Fry. The music was a cavalcade from Benny Goodman to Meatloaf. It’s not every day you can get an 18 piece band to play your dinner music and dance music for free. They were good enough to have the dance floor with someone on it all times and the first there were Neville and Gloria Shaw. The jockey came first again. Go Nev!! It was sad that the caravaners couldn’t organize a later bus to pick them up, we still had over a hour to go but the floor was full until we said goodbye to ’KHE SANH’. The return of the Cowra Dance by John Faram and Penny Gul. Jim McIntosh caught in a lift for 50 minutes without a beer and a young blond, with no one seeming to worry about his state of mental anguish. He survived !!! Ian Tasker every morning at 6.00am doing laps of the pool. Greg Quinlan also got into the act. Adam Gul doing 60 laps a day and Penny Gul giggling as she paddled around the pool- it sure is different. The trip started on Saturday 20th April when Suzy and I drove from Kempsey to QLD… We left my sister’s place at Morayfield Queensland at 6.10 for Brisbane Airport and there was a great deal of traffic. We arrived at the Airport about 7.30 we parked the car at Level 4 J.54, we had a fairly long walk down to the terminal. We booked our luggage in as well as my walker, they then wheeled me up to Bay 23 in a wheelchair. After being there for a little time some of our friends appeared they are also going to our Reunion. It was lovely too see everyone again after 2 years. We did not take off until about 10 o’clock, after take off we were served breakfast, it was very nice indeed. We were to gather at the Reflection Room at 6pm for finger food and beer wine and soft drinks till 9’oclock. Left hotel at 10.30 to go to the Army Camp at Robertson Barracks. We were escorted all around the Supply Company, this would be the largest Army Barracks I have seen it was massive. We were served a beautiful barbecue lunch, the Supply Company Members also dined with us, all these Soldiers were very very nice and pleasant. As we were ready to leave we all were given an Army Ration Pack to take home with us. How kind of them. We left there at 2.10 to go back to our hotel had a bit of a rest, but decided not to go out again, Sue went for a walk brought back some cheese and crackers, we had them for tea as we had a big lunch. We did not go to the Dawn Service , we had breakfast then went down to watch the MARCH. What a beautiful March. It was one of the best I have seen, there is no doubt about our Services they march so well it makes one so proud to be an Aussie, of course the beautiful horse lead the March, this year our men Marched under their own Banner and did they look great all dressed the same and of course our Ladies also did a good job with Marching how proud of them we all are. The Navy also looked terrific in their snow white uniforms. But all did a great job. We then went back to our hotel waited till 12.30 to come for lunch, oh what a lunch it was beautiful, we had a buffet lunch, plenty to eat different dishes, plenty to drink if you wanted it, also there were sweets. We are now off to some markets, oh what a crowd there were so many people there, so much food as well Sue went down to the beach to take a photo of the sunset, she said there must have been about three thousand people there, I was sitting on a brick wall waiting for Sue to come back and a nice young girl came up to me and said I have brought three fans and I have a spare one so I am going to give it to you that was very nice of her as it was very very hot. We are now down at breakfast again, we are to leave and go on a boat cruise before we go on the cruise we have a tour of Frontline Australia WW11 bombing of Darwin in 1942, the tour all round Darwin lots of buildings have now been replaced after Cyclone Tracy hit. It all was very interesting to see when you live so far away from Darwin you only hear about it not see the damage which has been done. We were early for our boat cruise so we waited. The boat was nice big one; first of all we are served morning tea. There were lots of boats on the water, but the most interesting is to see a Combie Duck on the water just looked like a car, it came up the harbour and just drove up the sand bar. To me it was amazing as never have seen any thing like it before, the trip on the water was quite good different places were pointed out to us of interest, most enjoyable to see. We are back on shore again now it is lunch time, we are dining on the wharf, did not like my lunch at all the fish was awful, but you can expect that some times. We get on the bus once again this time to visit the Darwin Military Museum for one hour, that again was quite interesting to look over, also there you could read little pieces on the Darwin cyclone, after that back to our hotel believe me it really has been full on all the time but again very nice. First of all we were to go out to see the Crocodile Jumping Cruise on the ADELAIDE RIVER. Well would you believe Sue and I were left behind the buses left early. There also was an other couple left behind so they decided to drive their Ute out to follow the buses, we went to the Wetlands first thinking the bus was there but no it was not, but we had a great adventure as we saw the big Buffalos in the waters it was amazing, the lady at the café there rang up were we were to leave on the cruise apparently they were still there so we were in luck. We saw the feeding of the Crocodiles, a home of 1600 of them , there were two ladies steering the boat, one of them would hold out the bait the Croc would jump that high and grab the bait it was fascinating to watch, also I really liked the birds that were following us they were magical to watch, well I thought they were, after our cruise ended we went along to the Humpty Doo Hotel for lunch it happens to be on the Stuart Highway but we did not give them much notice that there was so many people, so low and behold our lunches were very late, Sue and I just got our lunch just before the bus was to leave, we did make it. On the bus again back to our hotel to get ready for our Reunion Dinner and Farewell in the Arafura Room, at 6pm. We have rested and now it was time to dress for our next event, dressing in our finery went down to dinner every one seemed in a very happy mood the dinner was not bad. The band was great. We had a full Army Reserves band they were the best. They played old and modern music, as everyone are all getting older it was good to see so many up on the floor dancing, I could have sat there all night listening to the band playing ,but of course that was not possible, after saying our good byes to every one decided to retire to our room. Next day were picked up to go to the Air Port to get our plan home, we had to detour a little as a car had caught on fire on the highway, all you could see was black smoke and flames hope no one was hurt, bad news when we got to the Air Port our plane was delayed we were given meal tickets we wait and wait, more news came about the plane was still delayed had another meal ticket given to us looked like we could spend the night there. As well the air conditioning had broken down so it was very uncomfortable. We eventually boarded the plane at 6 o’clock. Sue had booked a room but we did not arrive the hotel near the airport until 11.30pm ,what a long day we have had. Now the next day we left the hotel at 8am to drive home the traffic that time of day is murder most going to work or business I suppose once we got to the NSW border it thinned out quite a bit and we had a good trip home, held up a bit at Coffs Harbour got to Kempsey about 3o’clock to collect my little dog She was very pleased to see me also me to see her, we now continue to South West Rocks pull up at Bilo to get some stores get home about 3.45 nice to be home but after said and done had great time with all my friends. I Hope to do it all again in two years time God willing.